This summer, we told you about Joy, a little girl in Kenya who faced not just stigma, but real mortal danger. 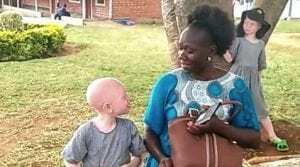 In parts of Africa where superstitions are deeply ingrained, albinos are considered “bad luck” and are sometimes even sold to witch doctors (or killed and sold) because of the belief that their body parts have magical properties. CFI Kenya has been combating these superstitions for years, and recently founded a Humanist Orphans Center to assist children abandoned or endangered because of witchcraft accusations. That’s why Joy’s mother came to CFI Kenya’s executive director, George Ongere, for help. With financial assistance from CFI Transnational, George was able to get Joy into a school where she would be safe and cared for. Now George has sent us an update in the form of a video of Joy at her new school, and as you’ll see, she more than lives up to her name. She is truly delightful. We could not be prouder of the incredible work George is doing for kids like Joy. So let us join what will no doubt be a growing chorus: Thank you, George!